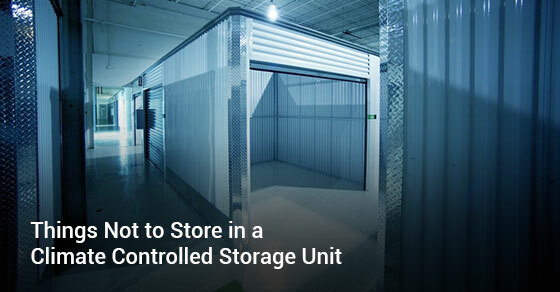 One of the coolest things (no pun intended) about renting a storage unit is that your space is climate controlled. This helps preserve your belongings, such as books, seasonal equipment, or collector’s items. Many items are easily damaged by fluctuating temperatures and humidity levels. There are some things, however, that you should not store in a climate controlled storage unit. Plants are biological organisms that need sunlight, oxygen, and water to sustain themselves. Plants can’t thrive in a climate controlled environment, especially if there are no windows. Plants will also leave a great deal of dirt and debris in their midst. We’re not sure why you would want to put your plants in long-term storage, but here’s a word of advice: don’t. Self-storage is meant for long-term use. You can use self-storage for storing winter gear during the warmer months, or vice versa. Self-storage is also a great option if you’re moving and need a secure place to store your belongings, if you’re going through a separation, or if you come into an estate inheritance. Keeping a self-storage unit as a home for your plant simply doesn’t make sense. Self-storage facilities don’t want your explosives, firearms, or munitions anywhere near them! Explosives are an enormous risk to the wellbeing of the storage facilities staff, not to mention the facility itself. If an explosion occurs, you may be held criminally accountable, as well as financially liable for causing damages to a commercial facility. A self-storage unit is not a cupboard! Don’t store food of any kind at your unit, even if it’s canned soup. Food spoils very quickly, even in a climate controlled environment. Storage facility staff will be able to smell food odours from outside your unit, and the smell will leak into neighbouring storage units. It’s recommended to not use any boxes or packaging that have come into contact with food or beverages. Whether it’s a basket that once held bananas or liquor bottles, the smell will linger and become very apparent in a small storage space. If you have excess toxic waste from a home improvement project or a science lab, a self-storage unit is not the place for it. Anything that can’t be handled with bare hands should not go in a storage unit, whether it’s climate controlled or not. This presents a biohazard to yourself and anyone else at the storage facility. We won’t ask why you have piles of cash…but we will remind you that storage contents insurance policies do not cover cash. If you need to store cash money, a safety deposit box (or better yet, a bank account) is the way to go. A climate controlled unit may seem like a good idea since your cash won’t become mildewy, but you’re ultimately putting your riches at risk. You might feel like the ultimate life-hacker by coming up with the idea to ditch your apartment for a self-storage unit. Rent is increasingly expensive, and by comparison, a self-storage unit seems economical. Self-storage units are also spacious, clean, and quiet. If you can deal with no windows and no neighbours, it might seem like a great living scenario. Think again. Living in a self-storage unit is strictly prohibited. Don’t point the finger at us. It’s the law. By the same token, you may not keep your pets in a self-storage unit, even for brief periods. Even if you have a pet sloth, it can’t stay with us. Some folks have asked if they can keep their pets in their storage units for a weekend getaway, and the answer is a resounding “no”. Keeping pets in a storage unit will immediately result in charges of animal neglect. The only pets you should be keeping in a storage unit are pet rocks. Speak to one of our customer service representatives for a full list of accepted and prohibited items. Climate controlled self-storage units are amazing for preserving sensitive items that can’t stand up to heat and humidity. Your grandparents love letters, your rare book collection, your signed Britney Spears poster—all of these things have personal meaning, and it would be a shame to lose them to a bit of moisture in the air.